Three completely different adventures in one week. Beer fest tour up next! They saved hundreds of dollars, which meant they have plenty of money to spend. We ate in Playas at Hunab-Ku, where they serve vegetarian tacos. Spent some time in downtown and drank at Mamut Brewery. Unfortunately, they had to leave early back to LA and by 5:00 pm on Wednesday they headed back. On Friday, I was supposed to host two girls via Couchsurfing. But they also had to leave early and did not spend the night. They already had a host and a guide, but I decided to join them for some time at the beach. 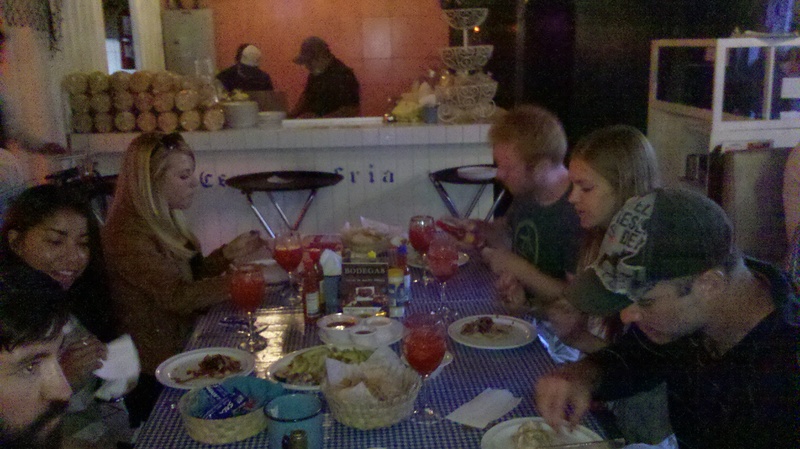 We hung out for a couple of hours and for a while, I showed them the Tijuana I know (and I ate a lot of food!). Unfortunately, they also could not spend the night and left early, but they seemed extremely satisfied with the city. A group of adventurers who have been to many places in Baja before but never in Tijuana, that group of friends that likes to go new places and try everything once (they even ate crickets). They contacted me via Reddit, thus they got the Reddit discount of $5 per person. A lovely group of people who I had a blast with. We met at the US border at 4:00 pm. Started drinking at Mamut by 5:00 pm, at around 6:30 pm dinner and more drinks at La Corriente (Cevicheria Nais). Downtown happened to have a lowrider and motorcycle show (it happens once a month). More drinks at La Mezcalera. Last stop before the border was bar Zacazonopan, but 10:00 pm came too early so they stayed for a couple more drinks, more tacos and finally got all 7 inside a cab to the border at around midnight (it was hilarious and very Mexican style). Week-long Tijuana Adventure complete. Now back to reality and my other jobs. Want to have a Tijuana Advnture? Check the upcoming tours or personalize a tour of your own!! NEXT TIJUANA ADVENTURE, BEER FEST April 26th! NextTijuana Adventure takes you to TRF!